Infinity jewellery is a popular and fashionable trend that has been largely growing due to its beautiful meanings and elegant look. 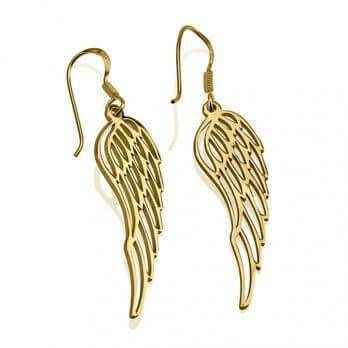 It makes a great addition to any type of outfit and can add a sentimental touch to your style. The infinity symbol is like a sideways figure of eight. 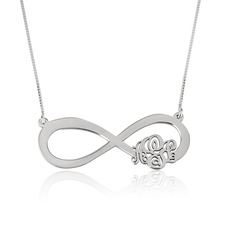 To some, the infinity can symbolize its more modern interpretation of eternity and everlasting love. However, to others their connection to the infinity draws from its ancient understanding as the symbol of perfection, duality and empowerment. The infinity symbol is not a new symbol - throughout the ages and various cultures the infinity symbol was used to represent different concepts and ideas. There is a meaning that has ritualized from India and Tibet, where the symbol represented perfection and equilibrium between the male and female gender. The infinity sign also appears in a number of mystical Celtic knot designs - which just like the infinity symbol have no end or beginning. The celtic knot designs actually bring a lot of resemblance to the Double Infinity Symbol, which is a representation of “double absoluteness”. The infinity symbol that we recognize today was first discovered by English mathematician John Wallis, in 1655. It is a concept of mathematics and physics that refers to a quantity with no bound or end - a quantity larger than any number. The word comes from the Latin infinitas or “unboundedness”. Scientologists refer to this as the eighth dynamic, which is the urge towards an eternal and infinite existence. The eighth dynamic also is named ‘the supreme being’ or ‘creator’ - embracing the wholeness and endless capacity of all - they do not believe in reincarnation but as us having "past lives". The infinity was originally known as the Lemniscate, meaning ‘ribbon’, by ancient Greek mathematicians and philosophers. 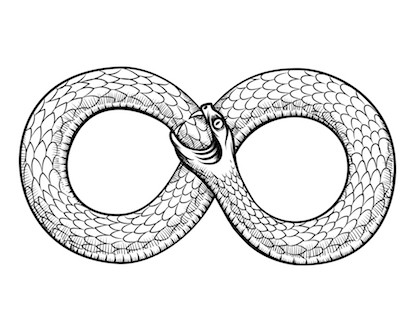 The idea strives form The Ouroboros, an ancient symbol depicting a serpent biting its own tail. It represents the infinite immortality, continuity, self-fertilization and eternal return. So already we see a connection in the meaning but coming from a place that we are less familiar with. Although the infinity symbol has become a secular mathematical/scientific symbol for infinity in numbers and eternal time & space, the symbol derives from a religious place, which has enabled us to determine such spiritual and positive meanings. 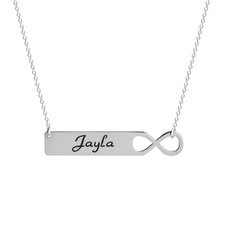 What is the meaning of an infinity necklace? For people today it is a representation of something endless, like a love or connection. With the two circles inter-connecting, each representing a side of the relationship, encompasses the idea of being ‘together for ever’. The infinity symbol can be drawn in one continuous movement and has neither a beginning nor an end. It holds with it the ideas of no limitations and infinite possibilities. While the concept of infinity or truly for ever cannot truly be grasped, it represents the desire for something to be everlasting. 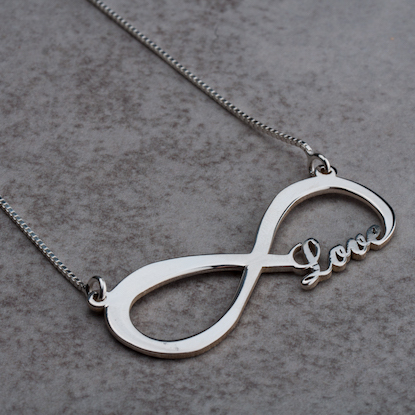 This is the reason many couples choose to wear the infinity symbol as an accessory or tattoo to express their love and connection. 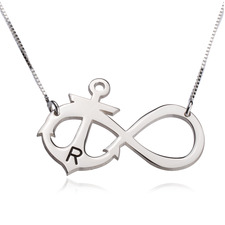 What does an infinity sign with an anchor mean? 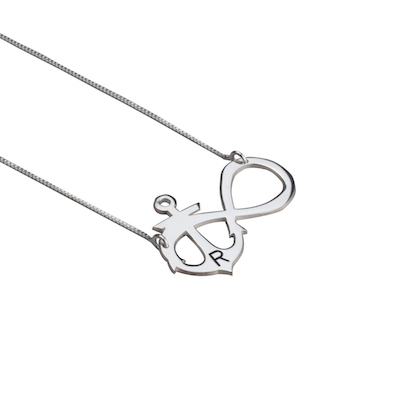 Anchor jewellery has become really popular trend, but even more so when incorporated with an infinity sign. So why has this become so popular and what does it mean? The anchor is seen as a sign of strength and stability, due to its function of holding down ships. 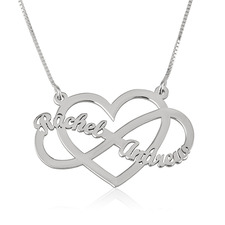 Together with the infinity it represents strength within a boundless unity, connection and world. 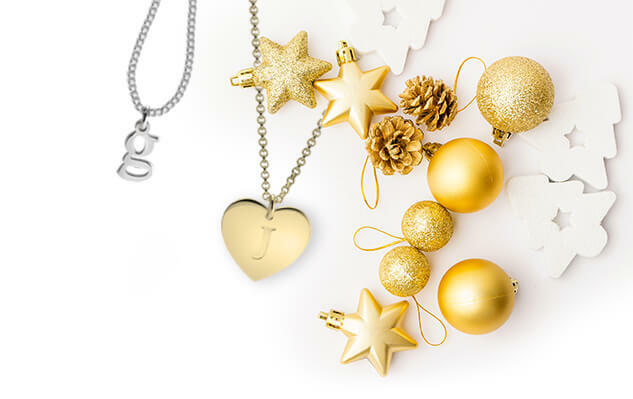 As a necklace, anchor with infinity makes a perfect gift for the person you love, someone who you have gone through leaps and bounds with, to express your unbreakable, strong bond. Power in Women - Together for ever! The infinity symbol has been used to represent the United Nations Development Fund For Women. 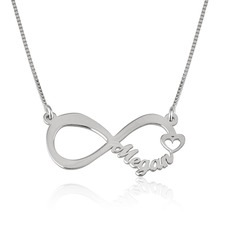 The symbol was introduced by Reese Witherspoon as Avons first ever global fundraising product - the ‘Women's Empowerment Bracelet’, which features a pendant in the shape of the infinity symbol, carrying the message of endless possibilities for women. 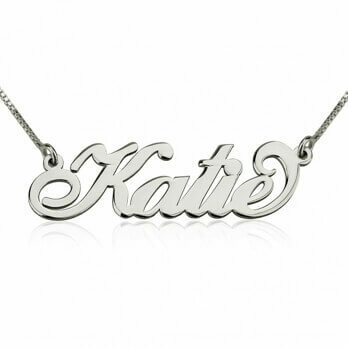 Although delicate, the necklace is very beautiful! I got it done in memory of my only child who died suddenly three days before his tenth birthday a year ago , and it's exactly how I want it. I'm extremely grateful that my specific requirements were honored. Delivery was way quicker than I had anticipated. I'd definitely recommend them to all!